For a night out or eating out in Ullapool there are many Hotels, Motels, Restaurants and Public Houses in the village all serving the finest food and a huge variety of liquid refreshments including, of course, an unparalleled range of Scotland’s national drink, Whiskey from all corners of the Nation. 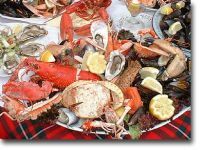 Locally caught Seafood to delight any palate including prawns, lobsters, crabs, mussels, scallops are on offer throughout the village add to this vegetarian and delicious Scottish beef, steaks etc and the contents of Scotland’s fabulous larder – gourmets delight!!. Situated on the shores of Loch Broom with magnificent views over the Fannich hills, The Arch Inn opened in 1973, having served for years as an inn and store for fishermen and fish curers. Over the years the venue has undergone many changes, but still remains at the heart of the village for locals and tourists alike. The upstairs dining area brings an innovative dining experience with a delightful à la carte menu and a daily specials board drawn from a local natural larder. For instance you may not be surprised to find organic chicken and foie gras, apple and pear chutney, and brioche, and marinated salmon, Jersey royal potatoes with beetroot and crab among the starters. Mains are along the same lines, with an excellent selection, ranging from pan fried halibut with ham cannelloni, broad beans and morel mushrooms, through to roast lamb rack in broad bean purée, with shepherd’s pie, glazed baby turnips and carrots. When the sun is shining why not sit outside and enjoy a drink, or a meal, overlooking the pebble beach, Loch Broom and the beautiful Fannich mountains off in the distance. If the wind gets up we also have some sheltered decking to the back of the bar where you can catch the sun as it moves over to the west, and experience some of the most magical sunsets you’ll ever see! 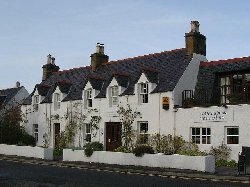 The Argyll is pleased to have been voted ‘Wester Ross Pub of the Year’ for 2011. We also feature in the Good Beer Guide 2011 and have achieved Cask Marque status this year for excellence in real ales. Bar: The Argyll is a popular & friendly pub that specialises in live music and entertainment. Especially in the season we tend to have live music or entertainment every evening from local acoustic sessions to talented singer/songwriters and bands to our weekly quiz night, making The Argyll a popular choice for local residents and visitors to Ullapool alike. Dining: Our seafood bar/restaurant offers a fine seafood menu using fresh local ingredients. Our locally sourced menu contains a range of local delicacies such as west coast langoustines, oysters, west coast mussels, prawns, Ullapool smoked salmon, scallops, Scottish salmon, lemon sole & sea trout. We also offer Highland lamb, fine Scotch steaks, Stornoway black pudding, Munro’s haggis and our renown homemade burgers and pies. We are very vegetarian-friendly and have a whole separate vegetarian menu, to the delight of veggie patrons. We also cater well for coeliac diners with various gluten-free alternatives available. The Ceilidh Place caters for all, with a coffee shop, snacks, luches and dinner (good Vegetarian & Seafood menu. ), bookshop, confrence room, bunk-house, hotel, all-day bar (abundance of real ales and malt whiskies). A hot spot for Live Entertainment, It exudes a laid-back, cultured ambience. They host a varied programme of arts events such as live music, plays, poetry readings, exhibitions and ceilidhs; a great place to relax and soak up some local culture. Once inside, the atmosphere is friendly and informal. The lounge for our guests, the dining room, and the bar all enjoy panoramic views of lovely Loch Broom, as do some of the bedrooms. by the Inverness and Highland branch of CAMRA. “The Good Pub Guide 2004″, and “The Good Beer Guide 2004″. The Morefield Motel is situated on the north side of the village, a quiet, friendly and informal atmosphere awaits all our guests Renowned for being the best seafood restaurant on the North West coast, our extensive menu is available for your perusal, you will also find a well stocked bar, over 50 malts & selection of real ales. The shop is conveniently placed near the camp site – for any of the last minute things that you have forgotten, the ferry terminal is close by for the isle of Lewis. The Coffee shop is upstairs, offering hot/cold food and drinks all at reasonable prices. West Argyle Street, ULLAPOOL IV26 2TY TEL:(01854) 613383 FAX: (01854) 613004 . Tennent Caledonian Breweries “Best Pint” award holder.